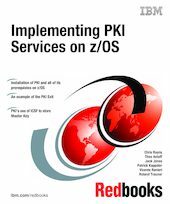 This IBM Redbooks publication is designed to help you understand and implement Public Key Infrastructure (PKI) Services on z/OS. As an overview of PKI Services on z/OS, this book looks into two different ways of installing PKI Services: the traditional step-by-step configuration that you do yourself, and by using the new IKYSETUP configuration utility, which enables you to enter certain parameters and then run IKEYSETUP to configure PKI Services for you. We also look at the PKI exit and show an example of this. A chapter about PKI Services and the Cryptographic Coprocessor discusses the Cryptographic solution on the IBM eServer zSeries 990 and shows how to boost your SSL connection with hardware encryption.